Techwaredist.com first reviewed the Microboards PF-Pro Inkjet CD / DVD printer back in December of 2008. At that time the 4th generation Microboards disc printer was a relatively new to market. Overall we found this printer to be the best inkjet printer offering from Microboards to date and a good price value. In the 2 years since the initial review, we here at Techware would like to share some of the important improvements that have been made as well and give an in-depth review. To read our first published review simply search Google with the following phrase "techware pf-pro printer review"
Microboards has continued to improve the overall durability and reliability of the PF-pro printer since we first started testing and using this printer for our in-house CD, DVD and Blu-ray disc printing. An internal fan was added in 2009 to help disperse ink over-spray as well as to help keep the print engine and main board temperature lower. The new fan keeps the inside of the printer much cleaner which allows for longer production intervals before cleaning is needed. This also gives longer life to the internal gears, sensors and circuit boards as ink build-up is greatly diminished. Microboards also updated the PF-Pro print driver in 2010 to allow for overall easier use of the printer and allows multiple printers to be hooked up to a single PC (we have tested up to 4 per windows XP PC). The new PF-pro driver allows for much easier print alignment on the disc. This feature helps the user make little centering adjustments if the print begins to float. Once again this is a huge benefit if you are running multiple Print Factory Pro printers. Even higher print quality through updated disc handling in “print zone"
We first started using these printers in December on 2007, long before they were announced or released to the public. 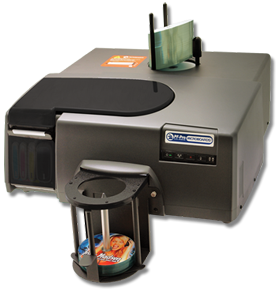 Since then the 4th generation Microboards Printfactory Pro color inkjet printer has been our printer of choice for standard 12cm CD, DVD, Dual Layer and Blu-ray disc printing. We have printed hundreds of thousands of discs on over 35 different PF-Pro printers during that time frame. Given the improvements and our success with the PF-Pro - the Microboards PF-Pro is the best choice if you need a new or used color inkjet disc printer. Read original PF-Pro Microboards printer review. Religious Organizations, Software Companies, Video Houses, Recording Studios, Universities, Government Agencies, Law Enforcement, Engineering Companies, Manufacturers, Marketing Companies, Ad Agencies, Content Producers, Medical Field, Publishing Houses and Service Bureaus to name a few.